In Fjord Norway, the mountains and fjords attract most of the attention. To experience them at their best, grab your hiking boots and get out there. Very few places in the world have such varied scenery in one and the same region as Fjord Norway. You will find fabulous hiking areas along the largest fjords, and several national parks offer great walks in everything from barren glacial landscapes to lush forests. Climb wonderful mountains by the coast, experience fantastic mountains that rise straight up from the narrow fjords, or join a safe walk on the blue ice of a glacier arm. A hiking holiday in Fjord Norway can be enjoyed by all types of people – you do not have to be super fit. Those who seek big adventures will find them, but there are also numerous short, gentle paths that are perfect for families with children or anyone who simply prefer to take it easy. Just make sure you find out which hiking routes are suitable for your level. You can read more about safety and how to prepare for your hiking adventure. There are a multitude of paths for self-guided hikes available. For more challenging climbs, we recommended that you join a group trip or book a qualified guide. We recommend Hvitserk as a local specialist. Many of Fjord Norway's most spectacular hikes can be done as separate day trips on the same holiday, and they are most definitely easily accessible if you own (or rent) a car. Visit before or after the high season to be sure to avoid crowded trails. Pick and choose from some of the area's most iconic hikes, add some new adventures to your bucket list and create your own itinerary through the magnificent fjord landscapes. Discovery Route is the historic tourist route (along the road RV13) through Fjord Norway, from Stavanger to Bergen. The route was established in the 1880s, when travelers came by horse and carriage to experience the spectacular landscape of mountains, glaciers, crystal clear rivers, roaring waterfalls, and pristine fjords. 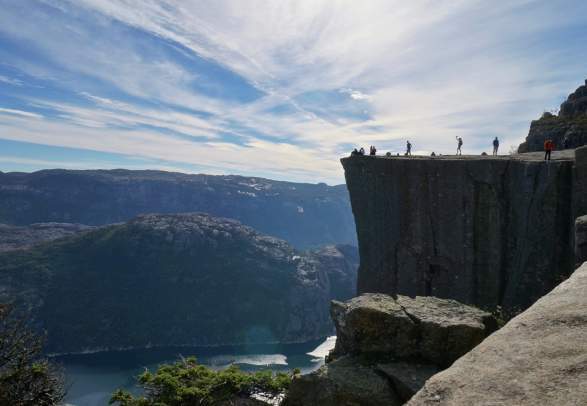 Along the Discovery Route you will find iconic hiking trips and some of the most visited tourist attractions in Norway; Preikestolen and Trolltunga. Historical and designer hotels will be your home. Preikestolen, Aurlandsdalen, Mount Skåla, Romsdalseggen, Hornelen and Trolltunga are just a few of Norway's most popular hikes. Find out what they have to offer here. 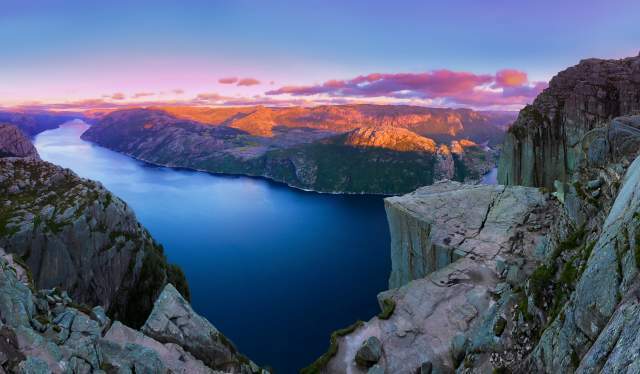 Looking out over the Lysefjord from Preikestolen is an experience of a lifetime. 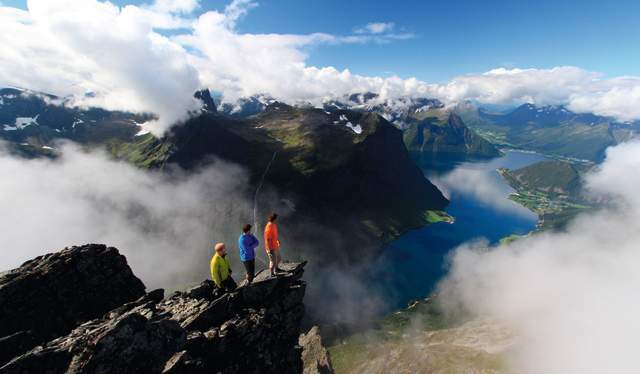 Combine the hike with a fjord cruise or join a guided tour at night or off the beaten track. Lush nature, fantastic fjord views and roaring rivers that are perfect for outdoor activities – the Aurlandsdalen Valley is called Norway’s Grand Canyon for a reason. In Norway, the Romsdalseggen Ridge is known as one of the most picturesque and accessible hikes in the country. Rising 860 metres straight from the sea, the hike to Europe’s highest sea cliff Hornelen is an experience out of the ordinary. Are you craving for scenic hikes but can't live without the comforting city lights? There are plenty of hikes easily accessible from all of Fjord Norway's urban centres. The seven mountains surrounding Bergen make great hiking areas close to the city. The terrain of Voss and Stølsheimen is more untamed but equally rewarding. Essential tips for a successful mountain hike in the summer. Let the experts do the planning for you. Discover Norwegian nature at its best with people who have a passion for outdoor experiences and who know the country inside and out. Quality is important, but the focus of Hvitserk’s trips are on natural and authentic rather than luxurious and exclusive experiences. 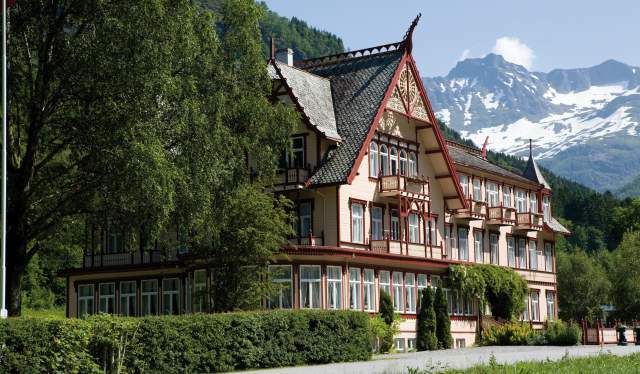 De Historiske - historic hotels and restaurants - is a unique membership organisation that includes many of Norway’s most charming hotels and restaurants. The hotels consist of landed estates, country houses, manors, timber-built houses and historical buildings in all sizes and styles. The hotels are also excellent bases for hiking in the surroundings.